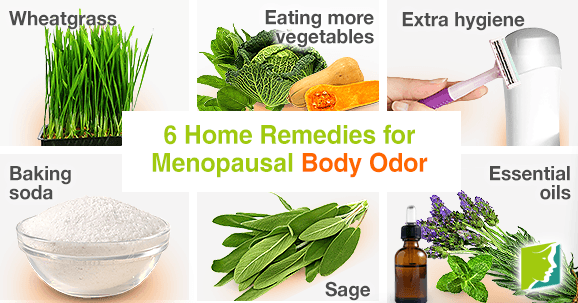 Menopause can cause an increase in body odor because during menopause, estrogen levels decline. Estrogen plays a role in the hypothalamus, the part of the brain that controls body temperature. This causes the body to produce more perspiration than usual, which can lead to increased body odor. Prescription deodorant and surgery can help reduce sweating and body odor, but the following home remedies can have similar effects with less risks. Choose clothing that does not trap body heat and sweat. Clothing made of cotton, linen, or silk allows the skin to breath so sweat can be evaporated quicker. This will help cut back on some body odors. Light-weight clothing that is not skintight can also help reduce sweating and the resulting body odor. Some foods can be particularly potent and create a scent that exits the body through the pores. This can make body odor even worse. Some of the worst culprits according to research studies are curry, garlic, and red meat. Try using alternative spices instead of garlic and subbing in tofu, seafood, fish, or chicken in for red meat. If hair grows in your armpits it may help to shave their in order to reduce body odor. Sweat takes longer to absorb when hair is present and because of this, bacteria that lives on the body has more time to break down the sweat and cause body odor. Regularly shaving can prevent this. Just as baking soda can absorb unpleasant smells in the kitchen, it can have the same effect when applied to body odor. This all-purpose household cleaner works by attracting moisture as well as killing bacteria, providing you with an economical and convenient solution. A warm bath and shower washes away sweat and can kill bacteria. Bathing daily, or even twice daily on a warm day, can help prevent sweat from building up and creating body odor. Essential oils can cover up body odor. Lavender, pine, and peppermint are some of the most popular choices. However, there are many different essential oils available so find one that suits your tastes and personality. It's best to test oils on a small area of skin before applying them fully, to ensure there's no skin irritation. Body odor can be a frustrating and embarrassing symptom of menopause. However, it should not have to become a facet of your everyday or lower the overall quality of your life. If body odor is becoming too much of a problem for you and home remedies do not work, it may be a good idea to talk to your doctor about it. Hopefully you will be able to find a way to reduce your body odor and breathe easy. Hormones have a direct affect on many bodily processes. Imbalances can therefore result in body odor. Click here to learn why.